Q – I have noticed small, green, tomato-like fruits growing on my potato plants. What are they and what should I do? Bunny – They are related so sometimes you do see this. I would pick them off so the plants are not wasting energy. Q – I have a lavender bush that has new growth every year but does not flower. Why? Bunny – If you cut them in late-spring you can remove the flowers before they flower. Best time to prune is in mid-August. Cut it back to just beyond the old growth and then that will encourage it. They need a hot summer baking and sharp drainage. You need to get them in the sun for longer. Q – I have an old Hydrangea that is suffering from a fungus. What is it and what should I do? Q – I have a 40ft (12m) Eucalyptus tree that is sucking the life out of the rest of the garden. Can I take it out or cut it back? Matthew – You would need to seek permission from your local authority. Q – How can I prevent the neighbourhood cats from using my garden as a latrine? Bunny – If you provide them with a perfect sandy box in a sunny, sheltered spot the idea is that that will distract them. Also put brambles over areas of bed that you want to protect. Pippa – Widely-available decongestant put onto used tea bags in the flowerbed can really work. Q – I have three courgette plants that took off very well, but now one of them is failing; why? Pippa – Look at the stem because there could be damage around the base. Q – I am trying to create a garden in Guinea with a touch of England in it. It is a tropical climate and by the sea. What can you recommend? Matthew – Canna indica would grow well. Melianthus major. Bunny – Box is very English and could work well. Plumbago. Dahlias. Q – With semi-desert conditions becoming increasingly prevalent in the south of England what vegetables can you recommend for an allotment? Bunny – Onions. Brassicas (apart from cauliflowers). Potatoes if you get good compost into your soil. Leafy crops. Roots crops. Celeriac on a raised bed would work. 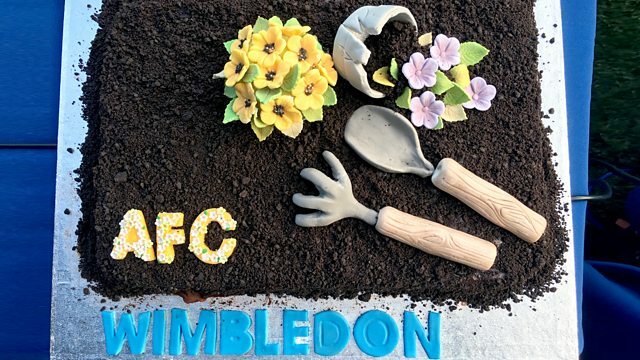 Q – What can I plant in our west-facing garden that will replicate the AFC Wimbledon colours of blue and yellow? Bunny – Yellow repeat-flowering rose: ‘Graham Thomas’. Blue: Campanula lactiflora persicifolia. Pippa – Daffodils and blue Hyacinths. A Ceanothus on a wall would be fantastic blue. Then a Fremontodendron.